The Japanese myths “Kojiki” and “Nihon shoki” were completed in the beginning of 8th century and tell of the creation of the Japanese archipelago. When this world was still in chaos, the first god and goddess, Izanagi and Izanami, stood on the heavenly bridge and put a spear into the ocean, causing it to stir. When they pulled the spear up from the ocean, a droplet fell, dried up, and finally became a small island called Onokoro-shima. The god and goddess landed on the island, married, and birthed Japan’s islands. The first island is believed to be Awaji-shima. Rich in beautiful nature and scenic, seasonal landscapes, Japan has fostered various cultural traditions and performing arts. Japanese people were known to have felt the gods in all nature, worship ancestral spirits, and sometimes accepted foreign gods as well. In order to thank, entertain, and ask them for a good harvests, people have devised a variety of domestic festivals and performing arts. In Awaji, shrine festivals usually involve a procession on a street and offerings at the shrines. 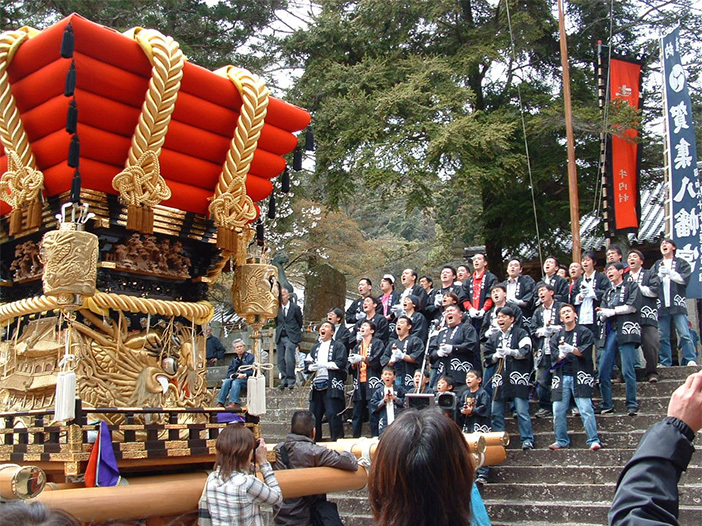 The procession consists of danjiri-uta (folk song derived from jôruri narrations) singers and mikoshi (portable shrine). The offerings include various entertainment such as danjiri-uta, kagura (sacred dance), shishimai (lion dance), and other dance repertoire. Awaji ningyô-jôruri, born as sacred entertainment at shrines, has been fostered and supported by the people who still deeply admire the power of nature and gods today. The folksong danjiri-uta is closely related to ningyo joruri puppetry. The song is basically sung at local shrine festivals, when processional futon danjiri, a portable shrine ornamented with layered thick mattresses, are used. The danjiri-uta is believed to have been born around 1890s, when futon danjiri was introduced into Awaji. There are regional varieties of the danjiri-uta such as Yoshida-bushi (a tune of Yoshida village), Ichi-bushi (a tune of Ichi village), etc., but currently the Ama-bushi style is prevailing. Ama-bushi were re-created from the climatic scenes of jôruri narratives. Recently, an old songbook titled Danjiri-uta-shû: Nishigumi Seigakudan (Anthology of Nishi group), written in 1930 by Emoto Chôhei, was discovered, which reveals the process of how the genre was created. According to the book, the songs “Imoseyama”, “Zundohei”, and “Ichinotani Futaba Gunki” were arranged by Emoto Zenpei (Kougetsu) of Kamimachi village in 1898. “Genpei Nunobiki-daki” was arranged in 1901, and “Ehon taikôki” and “Koshigoe” in 1905. The third section of “Tamamonomae”, which was most popular around 1910-20s, was arranged by Murakami Kamehei of Nishimachi village. Although Danjiri-uta has been mostly an oral tradition, with lyrics and singing style varying across regions, “Tamamonomae” is said to have kept its original verse and melody. Ô-odori (literally meaning big dance) and ko-odori (meaning small dance) are dances related to rainmaking prayers at a shrine. They belong to a genre ‘furyû’, which refers to the showy, gorgeous dance repertoire of Japanese folk performing arts. 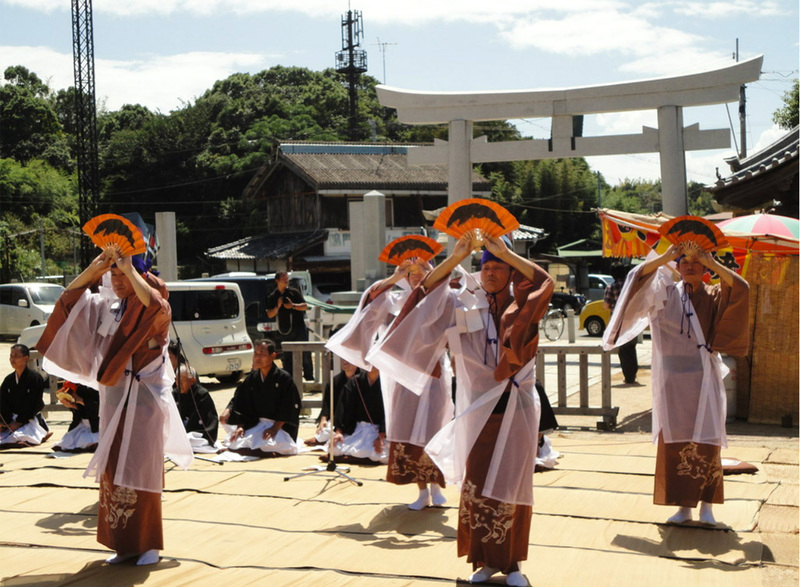 They are associated with the rituals of Kameoka-hachiman Shrine of the Ama region in Minami Awaji City. With its long history, the shrine is a symbol of pride. The Hachiman god was transfered from Iwashimizu-hachiman Shrine in Kyoto (established in 860) to Kamegaoka Shrine in Nishimachi (west side of Ama) and then moved to the present location of Kamimachi in 1232. The shrine has preserved several interesting performing arts attached to sacred rituals. 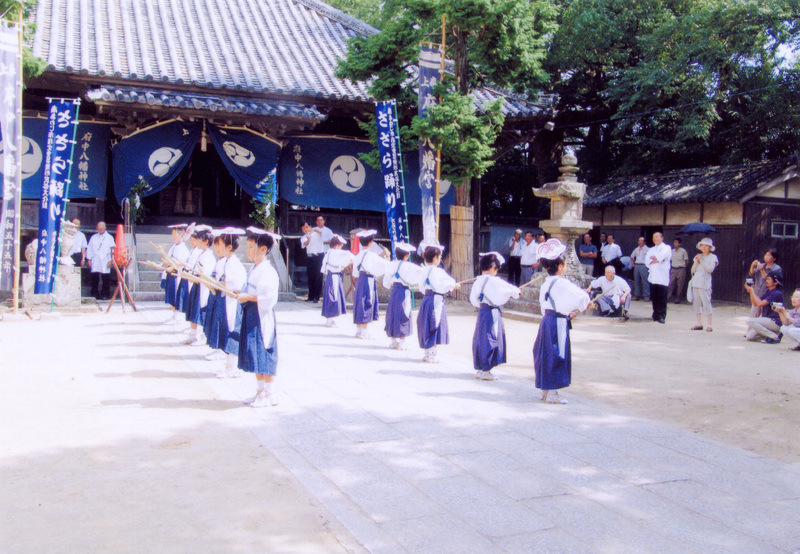 Among them, ô-odori, ko-odori dances are worth mentioning. When people would have a long drought, they would pray to the god for rain, and when they had rain, they offered the dance to show their warm thanks. They then would pray again for good crops and the prosperity of the village. As the dance required a big expense, it used to be called ‘Hyakkoku odori’, which means dance of huge amount of rice. This dance is performed by some 14 boys. Two boys beat drums and others carry bamboo whisks called ‘sasara’ and play them while dancing. It has been designated as the intangible folk cultural property of Minami Awaji city in 2008 and that of Hyogo prefecture in 2015. On the August 15th festival (at full moon), there is yabusame horse riding, sumô wrestling, and the priests’ dance. The priests, wearing strange costume and hat, carry drum, and perform. This must be a trace of dengaku dance (of the medieval times). Another document “Denrai no makimono” written in 1829 by Mano Izumi includes an explanation on the choreography of dance, which looks very similar to current practice. However, one of the songs found in the document has been lost now. Also, horse riding is not performed today. This dance has been performed in the Yagi district of Minami Awaji on the occasion of bon (Buddhist urabana=ancestral worship) and prayers for rain. It is said to have started as a consolation of the spirit of a man named Saizo. The man had went to a local governor to complain about troubles due to famine but was punished to death around 1781-1789. Five pieces were performed without hand props, accompanied by the song “Ha-ondo,” while six are danced with spear, long sword, sickle, or umbrella, etc., accompanied by the songs “Goshaku-bushi,” “Kiri-ondo,” etc. All the dances are accompanied by songs and a big drum, but differ in terms of their lyrics, the rhythm pattern of the drum, costume, and hand props. Major lyrics are related to the repertoire of joruri narratives. The choreography is said to have been created by the Buddhist priest Kyôun of Sao-dera temple. 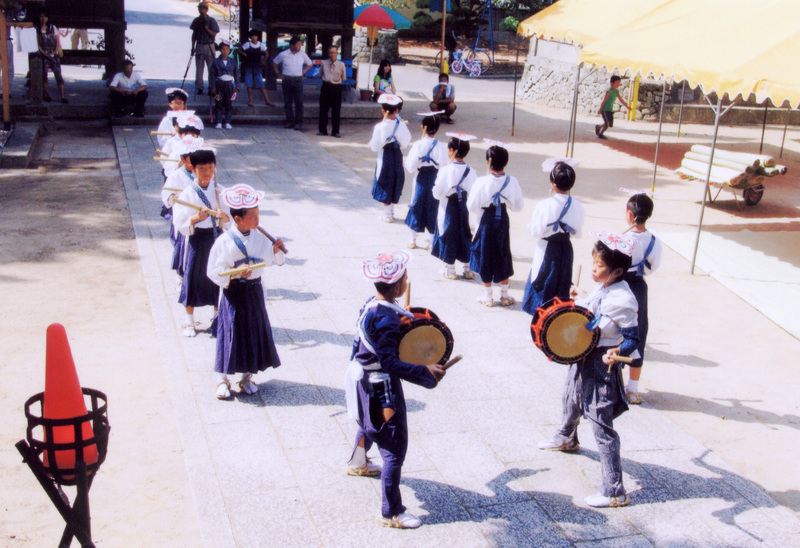 The dance is now practiced by the Society for preservation of Okubo-odori, but also played by children of Yagi Elementary School and students of Junior and Senior High Schools of Mihara in events such as athletic meets or school cultural festivals.